The UK’s ‘Brexit’ result is now one week and one day old and the global fallout has been, to put it mildly, dramatic. In the interim, we discovered that the pro-Brexiteers were, in Michael Caine’s immortal words, ‘only supposed to blow the bloody doors off’. In other words, their aim was not to win: their aim was to move up the political pole. The proposed Brexit was to be of direct benefit to them and to their political careers. Whether the UK decides to have a second referendum or whether MPs reject any proposed ratification of Article 50 remains to be seen. One thing is clear: those in government before the Referendum did not recognise nor did they engage with the fears and concerns of a critical mass of the electorate. The Brexiteers did recognise these fears: they engaged with them – and played on them. Has the last eight days thrown up anything the world of business might learn? I would suggest that it has identified a number of issues. 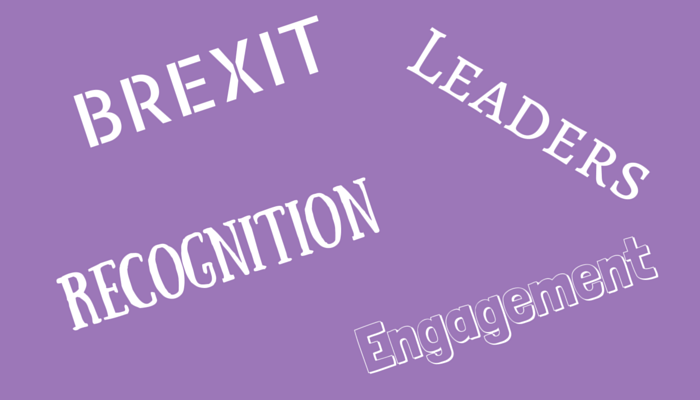 The Brexit campaign has thrown up three key points about the importance of recognition and engagement for business leaders. A greater proportion of older people voted for Brexit than younger UK citizens. The older generations report that concerns on key issues, chief amongst which became immigration, had not been recognised over a number of years. This has led them to feel increasingly aggrieved and disengaged from political life, leading eventually to their increasing marginalisation and alienation from society. In a business environment, when people feel unrecognised, they become marginalised and their engagement slips. This can lead to them mentally packing their bags to leave an organisation. If someone leaves, they leave with knowledge and understanding shaped by an organisation’s culture. It then costs to hire their replacement and to onboard them. Leaders should build organisations that listen to all members. If they cannot hear everyone, they need the help of tools that delivers the necessary depth of hearing. Dialogue builds community and communities can weather storms. Leaders need to be aware of and work to reduce any perceived gap between employees and the senior management team. This can be addressed by building relationships based on common cultural values. Most importantly, leaders should have the tools to hand, which encourage problems or issues to surface before they become mission critical. The Post-Brexit UK has created an increasingly damaging political vacuum. In turn, this has created market volatility and political uncertainty: and uncertainty leads to volatility. The government needs to address this situation as a matter of urgency in order to avoid further political, economic and, most importantly, human damage. In times of instability, the task of business leadership is to recognise and then address areas of uncertainty. The listening process outlined above gives leaders a method with which to identify uncertainty. Addressing the issues that are discovered allows them to treat the underlying disorder rather than trying to treat its symptoms. When the real problems have been identified and a plan of action has been agreed with the support of employees, company leaders will need to give their wholehearted time and support to its implementation. It will be important along the way to give recognition to those employees whose engagement moves the plan of action towards success. Remember, if uncertainty continues, investment will move elsewhere. Many who voted for a Brexit have been asking questions about the quality of the information on which they based their vote. They now doubt the Brexit politicians who told them that Brexit = fewer migrants + £550 million/week for the Health Service. From a distance, last Friday’s result started as a drama, but as events unfolded it has steadily moved towards a Pythonesque farce. This is not the ground on which quality governance decision are made. Those who emerge in positions of leadership after a period of turmoil, regardless of their affiliations, have to understand that their first task is to lead people to the solid ground. Solid ground is where people feel supported and recognised for the good things they do. Solid ground allows all employees – starting with the CEO, the foundation from which to make informed, quality governance decisions. Employees can then be invited to join in with two further tasks: planning for the future and calmly proceeding with the company’s business. Leaders will benefit from monitoring both processes as they will be able to identify the star performers whose engagement delivers future success. The Brexit’s aftermath has created political confusion, social recrimination and financial uncertainty. To cap it all, EU politicians have clarified that the main financial and political reasons for Brexit – money paid to the EU and rules concerning immigration, will stay the same if the UK wishes to continue trading with the EU. Talk about shooting yourself in the foot! In other words, they should be personally familiar with all facets and personnel of their organisation. They should not hide in a boardroom or behind rigid, hierarchical corporate structures. This model of leadership links to a final point. Of great importance will be a leader’s ability to give recognition to, and to reward those employees whose contribution demonstrates their engagement with company culture. If employees are recognised and rewarded by their leaders, they will more likely to be engaged – to be ‘living the brand’. In turn, this will encourage greater cultural engagement and marginal effort from their colleagues. Dr. Paul Gadie is a consultant and trainer for Gift Innovations – a rewards and recognition company based in Limerick, Ireland. He also lecturers in Theology at Mary Immaculate College, University of Limerick.